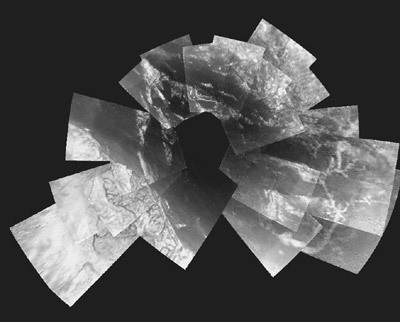 Composite image of Titan "coastline"
The European Space Agency has put up a mosaic of the images taken during the Huygens descent. I think that Huygens landed in the middle of the dark stuff. If so, the images and data from the surface indicate that this isn’t strictly an “ocean,” rather it is some kind of spongy material. A giant hydrocarbon bog, perhaps? Huygens had a GC/MS on board that took samples for 70 minutes, so we should get a quite thorough analysis of the molecular composition of the atmosphere during descent, and the surface material. The clouds/fog are also very interesting, if they represent “moisture” evaporating off of the “ocean” and then “raining” on the “land” to form the channels. We may be seeing a complete “hydrologic” cycle, except for the “hydro” part , since the molecules involved are hydrocarbons rather than H2O. It appears that a whole new vocabulary will be needed to describe the physical geography of Titan. Meanwhile, astrobiologists will have to be satisfied with the stunning pictures of the surface of Titan relayed by Huygens and released to the public. At first, Martin Tomasko, the University of Arizona-based principal investigator of the imaging team, speculated during a televised commentary that the large bluish shoreline implied a lake. But when the first image returned from the probe on the ground, it wasn’t sitting in liquid, but 16 centimeters deep into a spongy bog. Water ice pebbles surround the landing site.